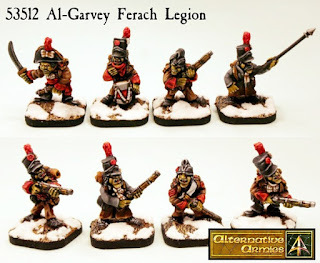 This week until Sunday midnight GMT there is 10% off every miniatures, pack and unit in the whole Goblin Army of Al-Garvey collection for Flintloque and Slaughterloo. Choose from personalities, lizard cavalry, dodo cavalry, light and line infantry as well as artillery and gun crew plus detonation dodos! Click through to see all the codes and the Goblins can be found in 5025 War in Catalucia and 5030 Slaughterloo.